Today I am going to focus on how to make a reliable keyword search for your project, irregardless of hte activity or business that you are dedicated to. 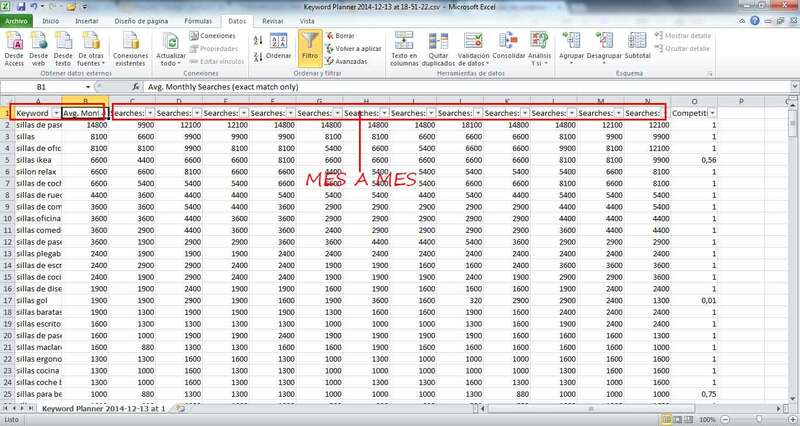 ¿How to find keywords for free? We will use the free tool Ubersuggest. This tool suggests keywords related to the work or category that we are looking for. We will add these keywords that we consider relevant clicking the icon +, in such a way that we will create a list of keywords to the right of the screen. Once we have a defined list of keywords, we copy them by clicking ‘Get” and paste then in the keyword planner, Google Adwords. We can segment the information depending on the country and time period that we want to select according to whom it is addressed (national or international) and the time that we consider relevant in terms of our strategy. We can export this list to Excel to work with the information more easily. 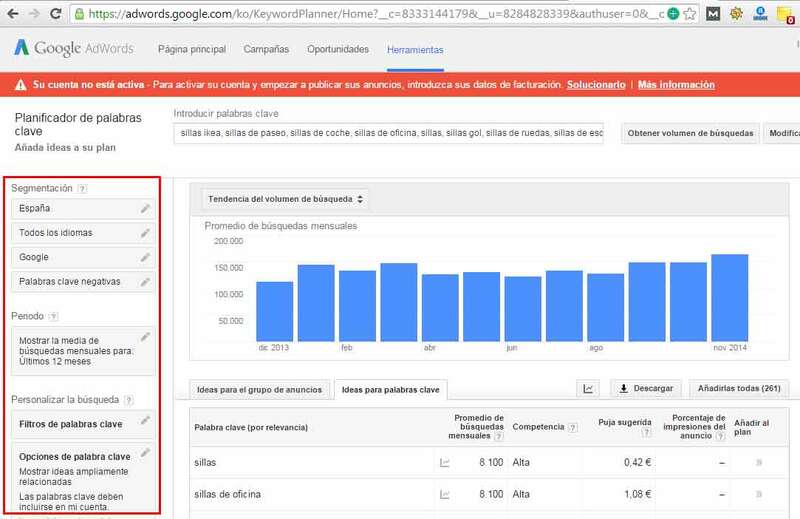 To obtain the keyword search volume of the keywords I am interested in, I tend to segment the searches to Spain with a period of time of the last rolling year. Once the information is exported to Excel, creating the following graphic in order to better visualize the frequency of a category of a specific category, such as, in this case ‘chairs’. Thus, the graphic shows the information of the ‘chairs’ category month by month, taking into account all of the keywords we have analyzed. ¿How do you search for keywords using SemRush? The SEMRush tool streamlines our work at the hour of the keyword search, since it directly suggests a large quantity of keywords by first introducing a generic keyword. 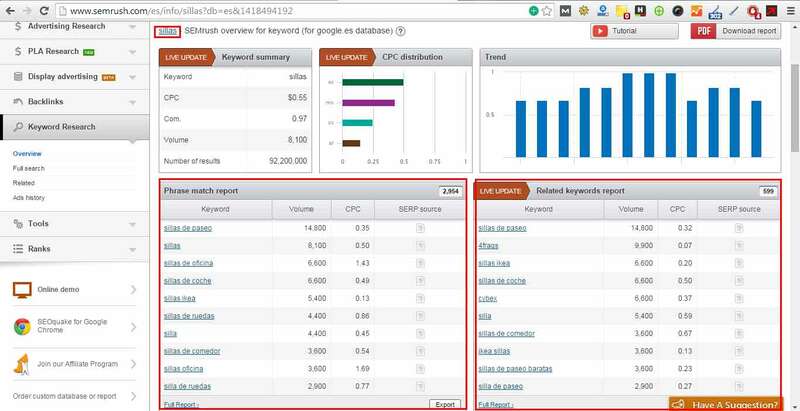 SEMRush gives us two reports, one phrase match report and another of keywords related to the search term entered. 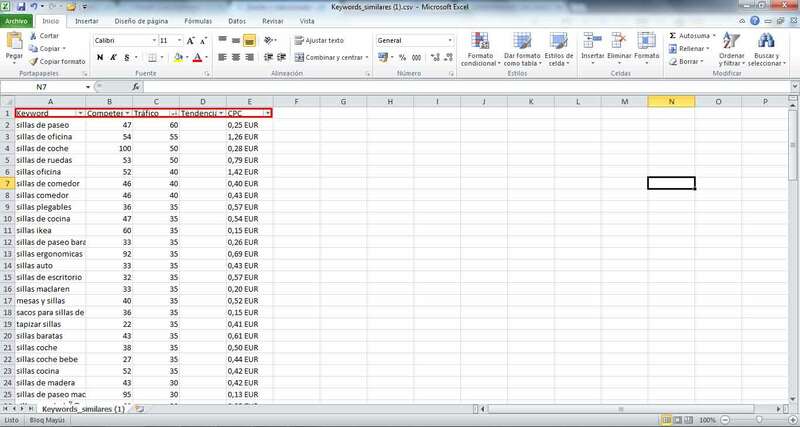 In this way, we can export this information to the Excel spreadsheet in seconds with all of the information that we need in order to filter and find the keywords that most interest us for our project. 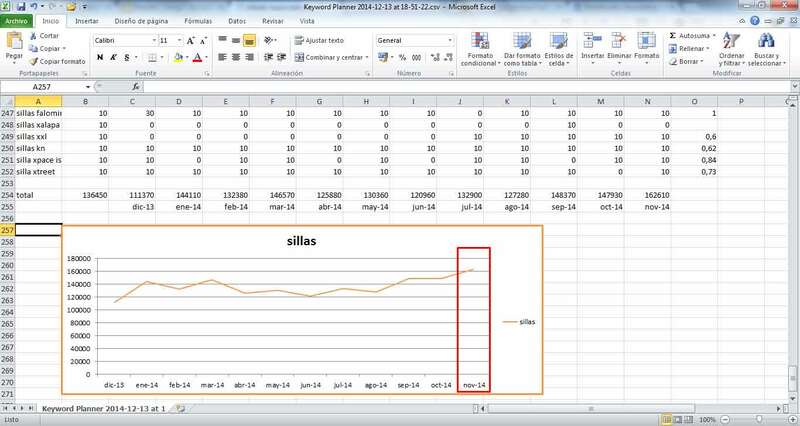 ¿How to look for keywords with Sistrix? In the same vein, Sistrix streamlines our work when we want to find a list of keywords for our project. 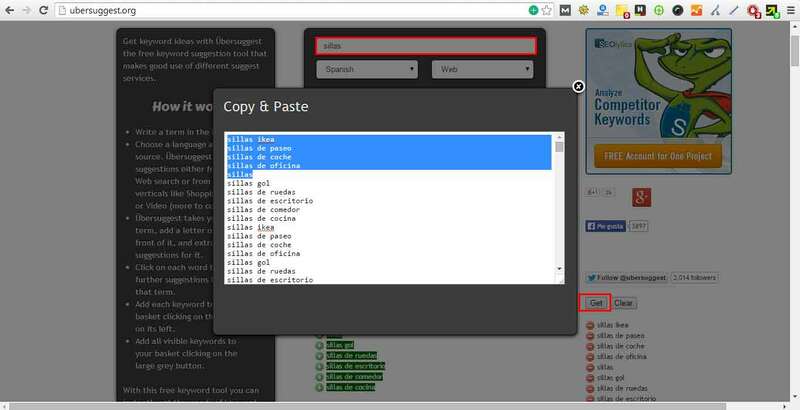 The greatest advantage of Sistrix is that this SEO tool is available in Spanish and allows you to find keywords very quickly, suggesting similar and related keywords, depending on the type of information you need. 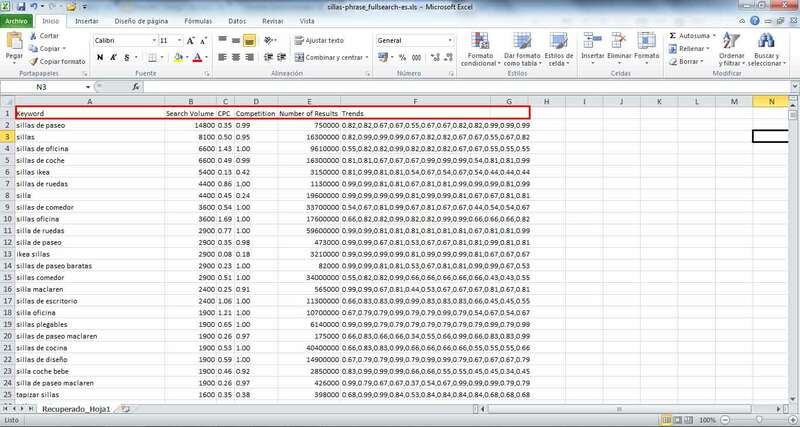 We can also export the information on an Excel spreadsheet to work with the information more conveniently. In addition, this tool is very useful to know which competitors are among the top-100 in Google and to see their evolution with the analyzed keyword in question. 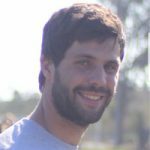 ¿How do I choose the best keywords for my project? Once we get a list of keywords like those above, regardless of the tools we have chosen to use, we will have to evaluate which keywords are the best for our project. To make a good choice, we will consider the domain strength, which we can see by using the free MOZ extension depending on the strength, we will analyze the existing competition of the keyword to assess whether we have the possibility to position ourselves on the first Google page. IN short, we will try to search for a balance between keyword search volume (the higher the better), the authority of our domain and the volume and strength of our competitors. ¿Which parts of my website should be filled with the keywords we have chosen? solitaire and loose diamonds iin an affordable price.